This research-creation project asks, how a contemporary form of archive in the Lac La Croix First Nation can be launched, based in intergenerational knowledge transfer and hybrid artistic practices? This archive will include digitized recordings of elders that will be made available to both the local community and project participants. 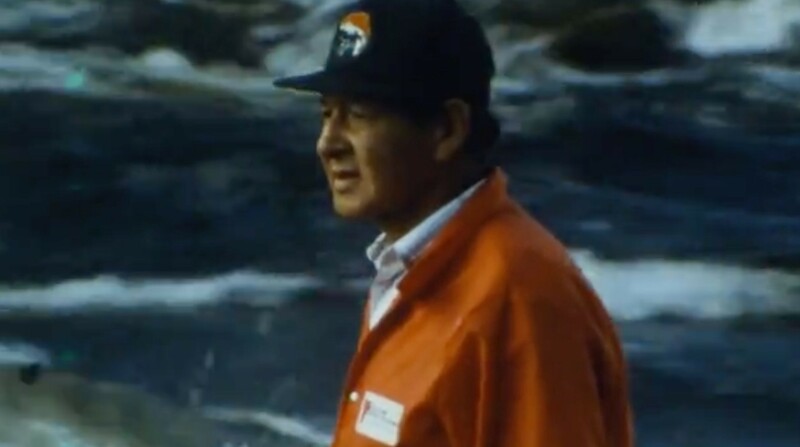 It draws upon documentary and literary sources produced by the Lac La Croix community and artists Judith Doyle and Ron Geyshick in the mid-1980s. Archivism aims to disrupt traditional boundaries between inside and outside the archive, mobilizing artist’s archives as dynamic, generative production tools. (1) This research-creation project asks, how a contemporary form of archive in the Lac La Croix First Nation can be launched, based in intergenerational knowledge transfer and hybrid artistic practices? This archive will include digitized recordings of elders that will be made available to both the local community and project participants. It draws upon documentary and literary sources produced by the Lac La Croix community and artists Judith Doyle and Ron Geyshick in the mid-1980s. Using the archived recordings as a starting point, this research will develop site-specific art and curatorial projects and educational workshops taking place at OCAD University and the Lac La Croix First Nation. These endeavours will be well documented and the information will be disseminated as artworks, refereed articles, publications, conference participation and a project website. What can contemporary hybrid media approaches contribute to making things that become repositories of knowledge and affect? Is an open access form of archive most appropriate? What are the balances between community use and broader accessibility? How can archival recordings of elders who may have passed away, as well as documentation of altered, lost or endangered places and activities, become starting points for new works in different media? What mutual benefits accrue when urban artists and remote communities collaborate to respond to archival community materials? Can we pair excerpts of archival recordings with creators who respond to the original record, either because they remember the person who spoke it, are a family member, or otherwise respond, leading to artistic collaborations to create affective new works? Through collaborative processes we strive to create studio spaces and practices where contradictions and complexities within the stories emerge, where the specific texture and content of experiences of the community are affective and present. We neither seek nor avoid strong sensation and difficult experience. This project seeks to create bridges and networks between studio and community practices grounded in both traditional materials and contemporary fabrication. It supports meaningful archival development, research, and material creation by and with indigenous communities, particularly the Lac La Croix First Nation, and provides a context for artists, students, and academics to engage with practice-led, research-creation and indigenous research methodologies. (1) Interview, Simone Osthoff, ‘Archivism (the dynamics of archiving)’, Neural ISSUE 58/Autumn 2017. For more information and to view the original documentary, please visit http://www.readingpictures.com/project_laclacroix.html. The Entangled Gaze: Indigenous and European Views of Each Other was a two-day conference co-hosted by OCAD University and the Art Gallery of Ontario. The conference convened an international group of scholars and museum professionals from the fields of art history, anthropology, cultural studies and curatorial practice to explore the topic of how Indigenous and European artists have represented each other in historical art and visual culture. The conference builds on the ground-breaking work of Julius Lips, “The Savage Hits Back, or The White Man through Native Eyes” (1937), Nii Quarcoopome’s landmark exhibition “Through African Eyes: The European in African Art, 1500 to Present (2010) at the Detroit Institute of Art, and on the research of project lead Dr. Gerald McMaster, conducted over the past decade, into how historical Indigenous artists in North America have represented their Euro-American Others. To develop OCAD University’s Indigenous Visual Culture Research Centre as an international leader in collaborative research on the art/histories of Indigenous and Euro-North American peoples. what are the consequences or results that arise out of this representation? For over a decade, Dr. McMaster has been gathering various types of information on how First Nations and Inuit artists depict Europeans or people of European ancestry. We are all, of course, familiar with European and North American artistic representations of First Nations and the Inuit; however, the reverse is not within the current artistic or public discourse. In effect, there is an unequal dialectical exchange. McMaster's course of research is intended to redress this inequality. In 2013-14 he examined 38 European collections, where much early North American material history is housed; since then, he remains the sole researcher with sustained interest in this particular subject matter. Dr. McMaster's research is grounded in the theory of the "reverse gaze," a conceptual approach he uses to promote Indigenous representations of Europeans as primary documents in the reconstruction of Canadian history. Conference participants are international and interdisciplinary researchers, museum professionals, artists, and Indigenous Elders. As anthropologist Regna Darnell has pointed out, cross-cultural study of the Other is no longer the preserve of the discipline of anthropology. Drawing from perspectives in art/history, cultural studies, fine art and anthropology, The Entangled Gaze will also generate print and online publications from a range of disciplinary perspectives. Select papers will be published as peer-reviewed articles in a special issue of AbOriginal: Journal of Indigenous Studies and First Nations’ and First Peoples’ Cultures, for which primary applicant Dr. Gerald McMaster is an Editor. Conference participants included: host Gerald McMaster; artists Kent Monkman, Bonnie Devine, Barry Ace, Rosalie Favel, Hulleah Tsinhnahjinnie, Embassy of Imagination, Lisa Myers; scholars Krista Ulujuk Zawadski, Rainer Hatoum, Kaitlin McCormick, Jonathan King, Nicole Perry, Monika Siebert, Christopher Green, Anna Brus, Markus Lindner, Rick Hill; and curators Wanda Nanibush, Nika Collison Jisgang, Kathryn Bunn-Marcuse, Nii Q. Quarcoopome, and Candace Greene. Kent Monkman, The Four Continents. Monkman’s major series “The Four Continents” reflected on the “painted voyage” from the Renaissance to Romanticism – a visual journey upon which Europeans projected their views of the world onto other continents. Kaitlin McCormick presented the work of Tsimshian artist Frederick Alexcee (1853-1939) and how he chose to represent his community of Fort/Port Simpson through an examination of works which he created and sold to non-Indigenous people. Nii Quarcoopome, Representation/Re-Presentation: Five Centuries of Changing African Depictions of the European ‘Other.’ Quarcoopome offered an historical review of this rich and complex visual record, and aims to illustrate shifting and conflicted African emotional responses to the European presence. Barry Ace and Rosalie Favell, In conversation, Every.Now.Then: Reframing Nationhood. Ace in particular spoke about the Anishinaabe Maungwaudaus’s trip to Europe in the 19th century. Justine Kohleal + Tak Pham, Virtual Indigenous Platform for Global Indigenous Initiative. They spoke about how the Indigenous Visual Culture Research Centre is embarking on the creation of a research and knowledge exchange that will link with local, national, and international universities, museums, galleries, and Indigenous communities. Jonathan King, Beyond the Glazing: Aboriginal Artists Behind Glass No More. King spoke about artists from the Arctic and the Northwest coast, and how they have taken control not merely of narrative in art practice, but of traditional continuity in politics and self-presentation. Krista Ulujuk-Zwadski, Stitching our Knowledge with Miqqutiit and Kakpiit. Ulujuk-Zwadski spoke about how Inuit art has a history of representing Inuit ways of life, beliefs and stories through an autoethnographic lens, and how the early Inuit gaze seldom represented “others” but was dominated by Inuit representations of ourselves. Elder Jan Longboat, Turtle Clan of the Mohawk Nation, is an Elder, educator, writer, herbalist, cultural advocate, and visionary, having dedicated her life to the dissemination and learning of Indigenous language and culture. Elder Longboat talked about Mohawk ways of seeing. Gary Sault, Anishinaabe Elder from Mississauga’s New Credit Nation. Elder Sault used various wampum belts to discuss Indigenous/European relations. Rick Hill, Two Row Wampum. Hill spoke about how the people from the ship and the people from the canoe viewed each other as told through the oral history of the Two Row Wampum; and how Indigenous artists were more open and less biased that the western art that followed, using Iroquois hair combs and western art to illustrate. Hulleah Tshinhnahjinnie, Visualizing Reciprocity. Tshinhnahjinnie presented the idea of how protocols enacted by Indigenous researchers, historians, and artists effects reciprocity, whereas western-based researchers, historians, and artists unaware of protocol as establishing relationships, tend to revert to utilizing research as a buttress of colonization. Christopher T. Green, [House] Post Modern: Tlingit Responses to the ‘Modern’ Revival. Green discussed Tlingit artists Nathan Jackson and Jim Schoppert’s individual critiques of the Western modernist aesthetics defining the category of fine art, which Northwest Coast artists entered into in the 1960s and 70s. Alexa Hatanaka and Patrick Thompson, Embassy of Imagination Artists Talk. Along with a number of youth from Kinngait, Cape Dorset, Hatanaka and Thompson spoke about how they achieve self-empowerment through creating collaborative projects in their community and public art projects by inserting Inuit youth voices in Southern Canadian city centres. Jisgang Nika Collison and Kathryn Bunn-Marcuse, Gud Gii AanaaGung: Look at One Another. Collison and Bunn-Marcuse spoke about how Haida artists during the 19th century documented their observations using voice and clever hands, often in life-like sculptures of Europeans and their exotic possessions, reflecting their complicated relationships with Euro-American settlers, colonial administrators, and visitors. Rainer Hatoum, Revisiting Boas: Exploring Issues of the “Entangled Gaze” on the Basis of His Field Notes. Reflecting four years of deciphering and transcribing Franz Boas’ shorthand notes, Hatoum’s presentation lent fresh insights into Boas’s lifelong attempts to grasp “Indigenous Others” and their manifold artistic expressions, which sometimes reversed the gaze onto Europeans. Candace Greene, Friends/Enemies; Partners/Competitors. Greene’s paper explored a small but important group of 19th century pictorial art from the Arikara and affiliated tribes as they engaged with Euro-Americans along the Missouri River. Nicole Perry, German Cultural Appropriations of Indigeneity: ‘Indianer,’ Winnetou, and Indigenous Interventions. Perry’s paper explored how Kent Monkman engages with and challenges (German) colonial pasts and Euro-American tropes of the “Indianer” and the cultural appropriation of the Indigenous image, thus exemplifying contemporary Indigenous struggles through the lens of native survivance. 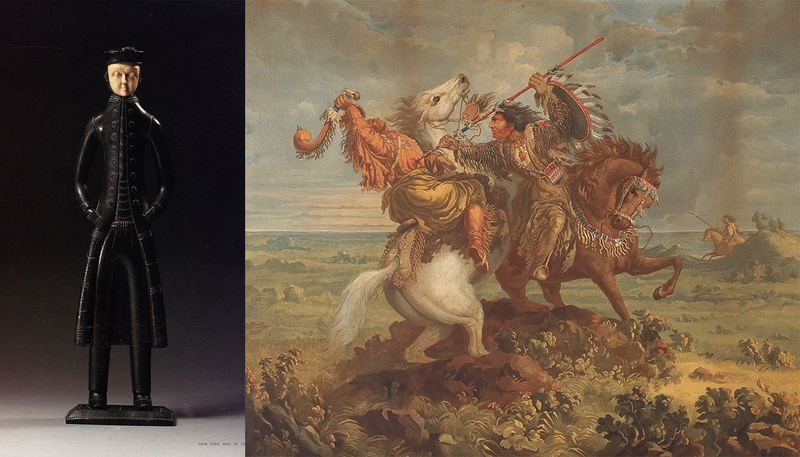 Markus Lindner, Buffalo Bill’s “Indians’ Gaze Back: Europe and Europeans in Arthur Amiotte’s Collages. Lindner focused Lakota artist Arthur Amiotte, who connects his family history – including that of his Austrian great-grandmother – with the general history of the Lakotas of the early reservation period.